Please join me in praying for the residents of Colorado who have lost loved ones and homes in the wildfires. A huge thank you to all the firefighters who have risked their lives to protect Coloradans and their homes. I love this cottage. It's warm, it's inviting and it's pink. Pink is not a color I would choose for just any home. But I think it works for this cottage. It's been another long spell since I last posted, but sometimes life just gets in the way, doesn't it? I spent two weeks working on an assignment for Wesleyan Publishing: seven devotionals for their Spring 2013 devotional publication "Light From the Word." Then this past week I've been playing catch up around the shop and preparing to add online sales to this site. I'm pretty excited about the prospect of an online shop, but it really takes time to make it happen. Enough already with my pitiful failure-to-communicate excuses. 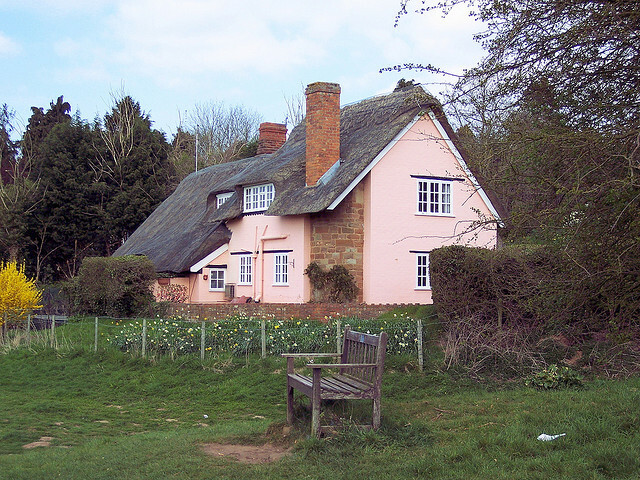 Let's look at another pink cottage I found. How about those bay windows? I can only imagine what they overlook, but my brain is capable of conjuring up some fairly extraordinary images. 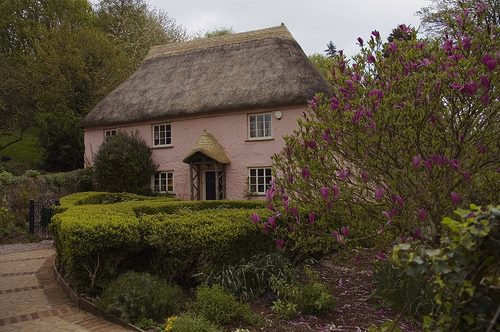 Looks like early spring at this charming pink cottage. The forsythia is in bloom. All three cottages are a different shade of pink, but did you notice they all have thatched roofs? Don't we just love those? 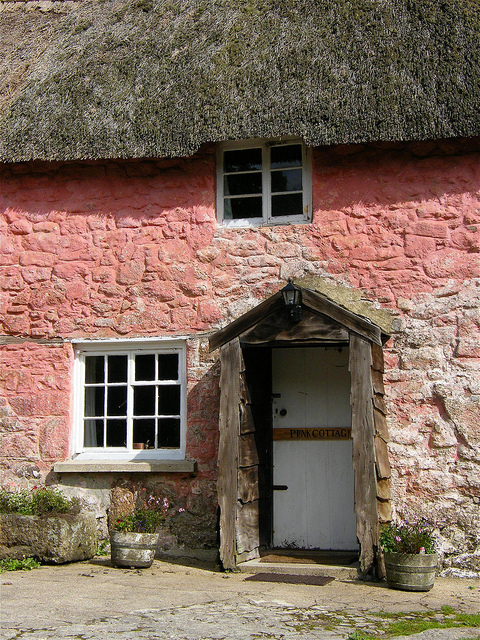 Ok, I have to tell you that out of all the pink cottages I've shown you this one is my favorite. It's so quaint and I'm drawn to the rustic look. And. . .well, look closely at the door. The wood trim says, "Pink Cottage". Perfect. I would have to do more with the flowers, though. I'm celebrating pink in the shop too. Recently a consignor brought in a plethora of vintage linens and doilies in a pink theme. The pink and gold vintage Hall teapot is delightful. Paired with the ecru, and pink trimmed large doily it says "tea party" to me. This little white ruffled doily with pink trim is sweet. I like to hang jewelry from the teapots in the shop for fun. Lovely Sherie, owner of Cottage Bliss, bought this intricately crocheted piece for her green and pink cottage. She'll fix the broken threads. Crafty girl. This little pink and green charmer went home with Sherrie, too. The green Hall teapot went home with someone else who collects. . .what else? Teapots. More pink goodies in the shop. . . This delightful vintage Southern Belle tablecloth is hand embroidered and machine trimmed. This is one of my favorite oils by my talented husband Dennis Reinke. Lewis Townsend, one of the local artisans I consign with, handcrafted this wonderful barnwood hanging wall shelf. The pink flower mosaic adds a touch of whimsy. Love the pink bliss cottage and all the other "pink touches." Charming and lovely, as always. If your little pink-and-gold Hall needs a Gentleman Friend, we have her mate in pale turquoise. And the THATCHES!! Those just take my heart. I'm visitng from Pink Saturday today. You have a lovely blog and I will follow you now on FB and on Google. Hi Nancy...Oh my...I LOVE that cottage in your header! I want to go inside. I also love cottages, the Rock Salt font, tea cups and tea pots, doilies, and hunting for bargains and treasures by thrifting and yard sales. What a treat to find your blog! I shall return!! Thanks for following Donna. So nice of you. 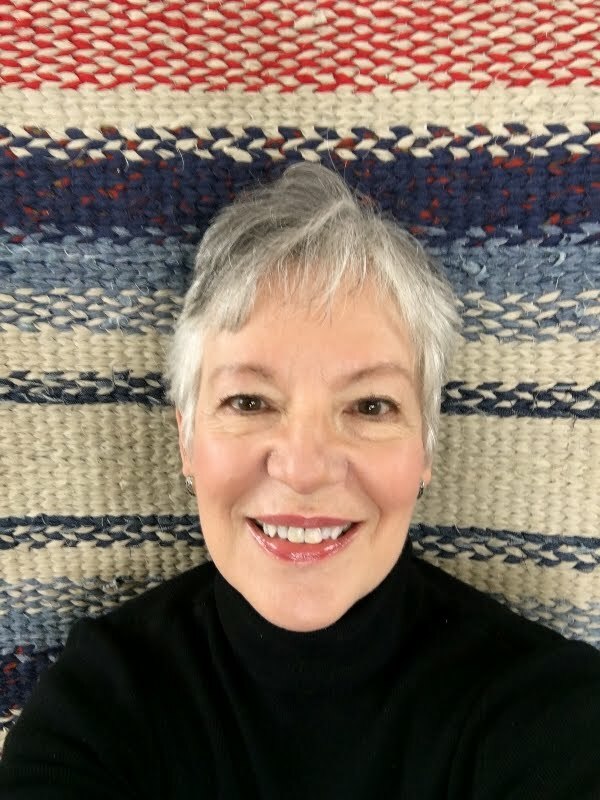 Hi Nancy, what a warm and beautiful post...and blog! Nancy...haven't heard from you in a while and knew you were VERY busy! I get so behind myself, but I don't have a new shop, so I don't have any excuses!!!! I LOVE all these amazing pink things! 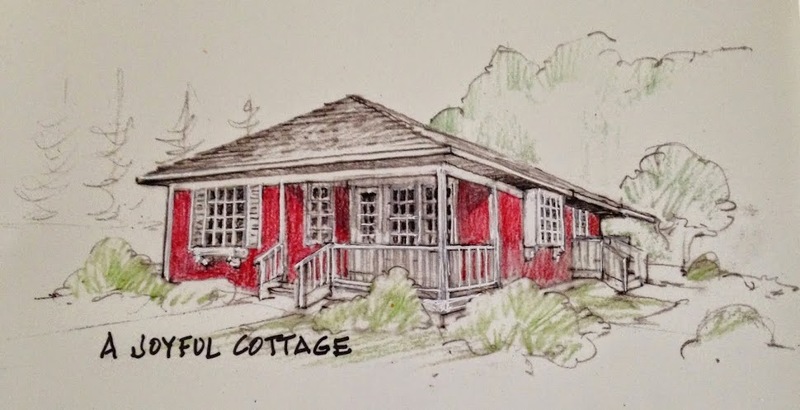 I agree with you that the rustic cottage is the best...such a wonderful place! But they are all so pretty! 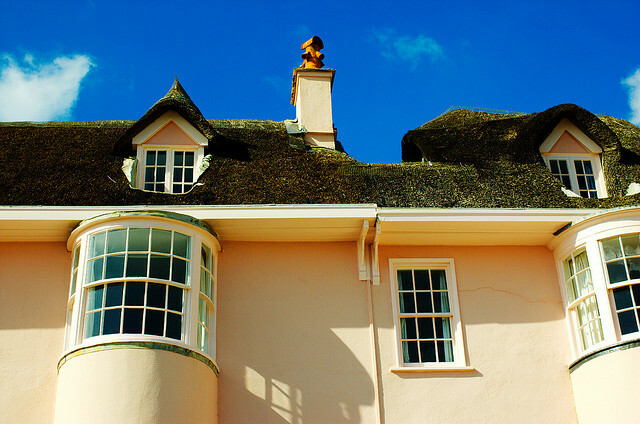 The thatched roofs always make my heart flutter! And I adore the ceramic teapots and crochet you show, as well as your husband's beautiful waterlily painting. He is SO talented! All my best, you two! While my son was in the Air Force, he and his family bought a home in Suffolk. These pink cottages are a common sight there. In fact, the colour is called "Suffolk Pink" and most likely originated when farmers mixed pig blood in the paint. At least that is what I was told. I sense a kindred spirit with you and I am so glad I found your blog. I look forward to following your delightful postings. I dubbed my 106+ year old farmhouse Crone Cottage and it is a slice of heaven to me and my mini-dachshunds, Rose and Fiona. Life here in beautiful North Carolina suits me and I am forever thankful that I made the move from my native Oregon to live near my only grandchild, Stella. Enough about me. Thank you for the uplifting, beautiful and charming blog!